What is a bibliography and why do we need it? A bibliography is by definition a list of writings relating to a given subject. In our case, a bibliography is obviously relating to bookmarks. There is not a single bibliography of bookmarks which might come as a surprise; there are many different ones. The reason for this variety is based on the fact that compiling a bibliography of bookmarks is a very complex project which involves research work on writings from a long period of time and in many different sources. As a consequence, bibliographies of bookmarks may differ substantially according to the interests and meticulousness of the author. And, it must be kept in mind as well that a bibliography is never finished: while you read these lines, somebody may be writing the next paper or book on bookmarks somewhere in the world. This means, a bibliography will also vary with the issue time. There are also specific bibliographies which concentrate on individual aspects of the bookmarks, such as Stevengraphs or medieval bookmarks. A bibliography is an extraordinarily important tool for all who intend to write a paper or book relating to bookmarks or to do research work on bookmarks for other reasons. Imagine, you are a journalist and you wish to write an article about the historical bookmarks in your country. You may have found some information through Google and in libraries about this subject, however, you cannot be sure if you already know all there is to know. In such a case, a bibliography of bookmarks can provide invaluable support. Another reason for the significance of bookmark bibliographies is that they may serve as well as a knowledge base for research on other topics, such as history of companies, customs and habits in different countries, development of advertising & design in historical eras, international affairs and political propaganda, and many more. This is possible because bookmarks are not only objects of research in their own name, but they are also carriers and conveyors of manifold information, and thus reflect the spirit of cultural eras. We believe that a collection of existing bookmark bibliographies, as will be listed on this page by and by, represents a valuable resource about bookmarks and historical developments of other subjects, and may serve a broad audience stretching out over the boundaries of bookmark friends. Of course, it is evident that the bibliography has to grow with every new publication and therefore needs continuous updating. At this point, we would like to invite our visitors to support us by submitting information which might have not yet been added to the bibliography. Please use the contact form below for this purpose, and thank you very much for your help. 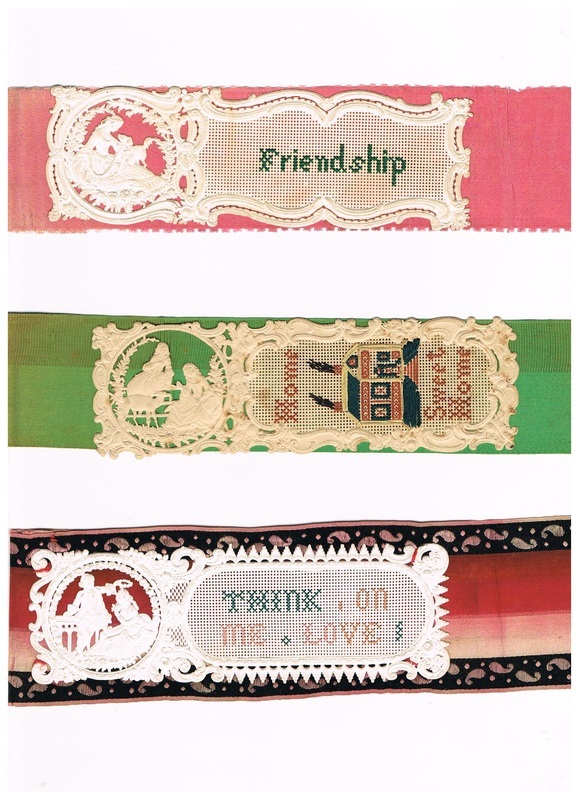 Bristol board bookmarks from the 19th century, embroidered in homework by Victorian ladies. The Bookmark Society (TBS) in UK publishes since 1989 newsletters which contain articles about bookmarks and bookmark relating issues. This bibliography is a list of all articles published in the newsletters of TBS between 1989 and the present. Besides these three periodicals, TBS also publishes so-called Occasional Papers devoted to various themes of bookmarks. The bibliography lists data of articles published in the past issues of all three newsletters and the Occasional Papers. Bibliography of the Occasional Papers published by The Bookmark Society (TBS). Print copies are available on request to Sylvia Bunting (bunting7 (at) btinternet.com), price on application.